[In the treatment of diseases relating to nose, cases should be so taken as to lay bare the background of the active and slumbering miasma of the case. All the chronic cases should be miasmatically dealt with. One will find that limiting oneself to the indicated remedy, determined on the basis of pathology and the modalities of the symptoms, the disease keeps coming back and reappear again and again. On such occasions and in such cases, prescribing basis should be changed. The miasmatic remedy, especially the biologic, and particularly the nosodic remedy, should be sought for and dispensed. Having found such a remedy, it should overrule the whole case. Refer my article. Can Anything Override The Principle of 'Symptoms Totality' In Homeotherapeutics? Useful in nasal catarrh. The nose is stopped up at night; the patient wakens up gasping for breath. He is worse at 3 or 4 a.m. The cough is dry and tickling, associated with hoarseness, and with a great deal of oppression from mucus in the chest. The nostrils are sore and raw, and sometimes, in children, there is discharge of bluish-colored mucus. (This symptom is also found in Kali-bi., Nat.Ars., Am.m., and amb.gr.) At times the coryza is scalding, excoriating the upper lip, with burning in throat and along the trachea. There is feeling of a lump in the throat. Dry night cough comes, which seems to threaten suffocation. Beating like a pulse in the chest. Am.Carb.is particularly suited to winter catarhhs. The sputum is slimy and contains specks of blood. D.D. (i.e. Differential Diagnosis) with Am. Mur. Carbonate cures catarrhs, worse in winter, nose stopped up, worse at night, awakening the patient from sleep, gasping for breath, worse three to four A. M. The Muriate causes, intensely, stoppage of one nostril; both stopped up at night; nostrils sore and raw; discharge of bluish mucusor scalding coryza. In the 3 a. m. aggravation Am.Carb. can be compared with Kali salts. Am.Causticum can be compared in respect of rawness under the sternum, this is the best remedy in the whole materia medica for aphonia, with burning rawness in the throat. 1) Perfect picture of sneezing influenza, involving post-nares, palate and fauces; pain in forehead and eyes. Lobil. Syph. Coryza with Stopped-up Nose: Teuc.M.V. Perforation of Septum: Kali. Bi. Penthorum Sedoides: is useful in the incipiency of coryza when there is rawness in the nose and throat. Also constant wet feeling in the nose, without coryza. Later there is a formation of thick purulent discharge, just as in Pulsatilla. Spigelia: One of our remedies for catarrh of the posterior nares. Profuse discharge of mucus through post. nares. Nasal mucus passes off only through the post. nares. Epistaxis with Occipital Headache: Rhus Glab. Coryza and Catarrh of Natrum Carb. Post-Nasal Catarrh and obstruction of Nose, Associated with Liver Disorders: Myrica Cer. Fluent Coryza with Stuffed up Feeling: Nat. Ars. Nose-Bleed from fall or blow: Acet. Ac. Watery Discharge from Nose while Eating: Trombid. And at no other times. Acute Cold of Phthisis: Ferrum Ph. To Terminate a Cold: Nat. Ars. Coryza, Fluent Right Nostril, Left Stopped up: Solanum Nig. To Break up a Cold: Nepeta Cat. Rhinitis with Pharyngitis : Mangifera Ind. 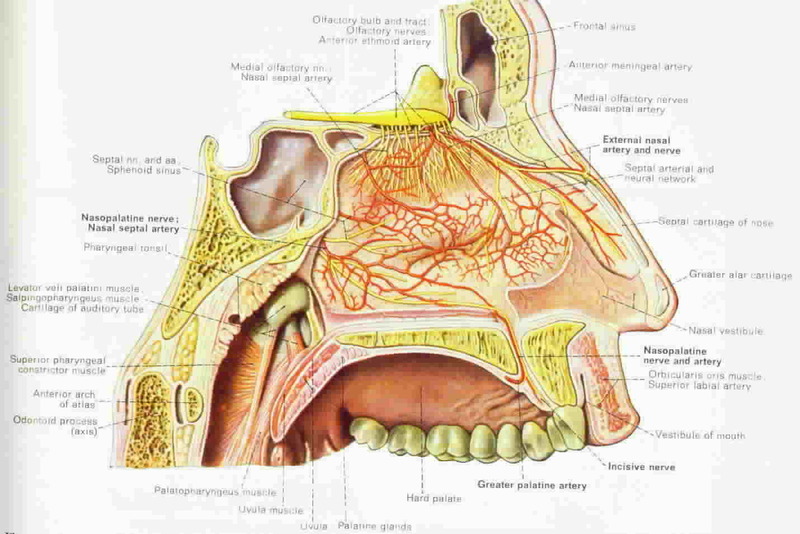 Obstruction of Left Nostril: Sinap. Nig. Profuse watery coryza, marked agg. from inhaling the least dust. > indoors. Acute Cold with deep Hoarse voice, even Aphonia: Populus Cand. Acute Coryza with Fluent Excoriating Discharge: Nephthal. Sneezing in spasmodic Paroxysms: Sabad. Profuse lachrymation; copious warty coryza, face hot and eyelids red and burning. Epidemic Influenza, with violent Retching: Sarcolactic Ac.